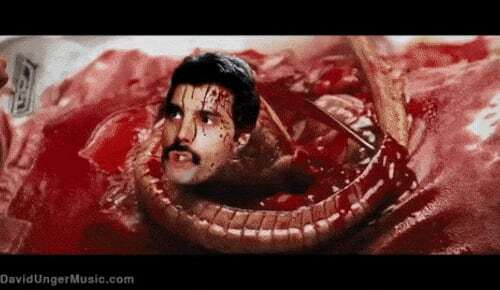 Who in the realms of space ever thought to put Freddie Mercury in among the cast of the Alien franchise? Set to the rocking soundtrack of Queen, the trailer features hits "Killer Queen," "Don't Stop Me Now," and "Bohemian Rhapsody." When you eventually take the video off repeat, here are 10 more horror mashups to tickle your internet funny bone (in no particular order). David Unger is back to serenade you with his creepy "face replace" videos. This time we are heading down to Atlanta and thrown into the mix of AMC's The Walking Dead apocalypse. The extremely catchy "Livin' Off Your Love" takes classic scenes from the past six seasons of the show and sticks the band's faces on them. We can only assume there will be a melancholy sequel when Negan has smashed someone's head in during Season 7. Christopher Rule's Scary Mary is one of the first, and arguably best horror recut trailers out there. As she flies down from the skies a dark cloud descends on London. Those poor children trapped in that old house with the creepy witch. I am pretty sure they won't be adopting the Scary Mary principle for Emily Blunt's Poppins sequel. Two of my favorite things combined in one minute of unadulterated filth. The second season of Ru Paul's Drag Race: All Stars has just finished, but just like American Horror Story, we hope it is back for more. The recut trailer gives us a look at all those faces who made it to the All Stars edition — presumably the horror comes from seeing them out of makeup. Recutting our icy adventure as a blood-chilling horror, the Frozen horror will send a shiver down your spine. With Princess Anna in full Snow Queen mode, we see her true intentions. Complete with tension-filled running music, snowman slaughter, and the haunting "would you like to build a snowman?" The trailer puts Disney in a whole new light. Living with creepy Billy the Doll from the Saw films — what could go wrong there? A hilarious parody of what living with a homicidal doll can actually do. Nothing like Child's Play, Billy sets traps for his flatmate Gary. Walking across a floor of safety razors, drinking sloth's blood, or getting keys out of the family dog with an ice cream scoop — who thinks of this stuff? If Jigsaw is what floats your boat, then check out Screen Junkies's send up of the entire franchise. Watching it back, it is amazing that we ever got to seven films (and an eight in production), but we did. Screen Junkies are famous for their mocking of popular franchises, having ripped Game of Thrones, The Walking Dead and The Avengers. You can now add Saw to that list of well roasted trailers. If you are anything like me, cleaning is a horror enough of its own, but short films MOP brings a whole new level of fear. Picking up on the classic horror cliches, we see our protagonist being stalked by a mop — not even your fancy Vileda kind, just a grubby old mop. In classic Michael Myers style he finds himself being followed home by the floor scrubber, only to reach a terrifying conclusion. At least there is something to mop up the inevitable blood. Apart from One Hour Photo, Robin Williams wasn't exactly known for horror films. Now the legendary actor lives on through the medium of YouTube. Some clever film buff has cut the feel-good Mrs. Doubtfire into a psychological thriller. It all makes sense now — husband stalks family under guise of lovable nanny, husband kidnaps kids in jealous rage, husband drives family into a nearby lake for a watery grave. This stuff writes itself! What if you had no control over your life, couldn't choose when to eat, go to the toilet, or go to sleep? Imagine yourself taking a relaxing dip in the pool, then the ladder disappears. You call the police, but a sad clown turns up instead. Welcome to the horror of The Sims — putting a pretty grim reality check on our computer animated townspeople. We all used to love barbecuing our little Sims, but watch this and I bet you'll have second thoughts. Who'd have known that a Dr. Seuss film would work so well when reimagined as The Babadook. The best part of the trailer? It keeps Michael Myers's Cat in the Hat completely out of sight until the very end — his performance was scary enough as it was. However, the trailer swaps out the campy comedy for horror, with a young Dakota Fanning being stalked around the house by the dark entity in a big hat. That's enough for today internet, back to watching cute kittens or Halloween makeup tutorials on how to be a pumpkin this year. As for Freddie vs. Aliens, we just need some studio exec at 20th Century Fox to see this and makes a proper Freddie vs. Jason Pt. 2! Read next: Coxy Lady: Listen To Laverne Cox's 'Sweet Transvestite' From The 'Rocky Horror' Revival!